I’m deviating from thoughts explicit to higher education a bit in this blog post, however I’m going to use a couple higher education examples. Recently I received a call from a friend seeking some advice or at least someone to listen as she worked through the pros and cons of a professional opportunity to advance her career. Like many of us, I presume she had the proverbial list of pros and cons side by side to help in the decision. Many of us have done this to provide ourselves with appropriate perspective and maybe even rationale for our decision. It’s been my experience that some people want to climb the professional or corporate ladder of responsibility while others find their professional spot and are most comfortable fine-tuning their craft day in and day out. This friend’s circumstance was providing her an opportunity to move from what I consider to be a middle management position- or director level- into a vice president and senior leadership role within a college. For further clarification purposes, I see a manager with supervisory responsibility of a variety number of staff who are department “worker-bees” carrying out the initiatives of the department every day. While these people have some level of decision-making responsibility, ultimately they follow the lead of the manager. The new role would provide this individual with an opportunity to participate more intimately with the strategic vision of the college while also assuming some responsibility of deploying that vision within her department. As I listened, my mind quickly went back to a time when I was contemplating a similar decision. I wanted to provide her with some advice, both that of which I received and maybe advice that had not been shared with me. While I’m never short on an opinion or advice, I was fixated on one question that I felt would be relevant to her decision. Three thoughts quickly came to mind. First, managing (or “coaching”) experienced Directors is very different than managing less-experienced entry level positions. A person in the vice president role must have the ability to articulate the vision and direction to create the buy-in of Directors who may at times have more experience in the business. Furthermore, it’s less likely that these individuals will simply do as you say. Instead, they will require greater rational and expect to provide greater input or influence on your decisions and rightfully so if you are to take advantage of their experience. This can require more patience, persistence, and perseverance of the manager. The challenge becomes when you disagree at this level. Second, your enjoyment of the job is directly connected to the quality of the relationship you have with your direct reports. This relates somewhat to point number one. You hear of people who come into high responsibility roles and immediately “clean house” with the previous management team. While there are different opinions on this I’m sure, in my experience I realized first-hand why some people may be inclined to do this from day one rather than go through the effort to determine if the partnership will work under new leadership. Sometimes the agony of that process can limit the ability to move forward with strategic goals as quickly as you or even your supervisor would like. So, a path with potentially less resistance may in fact be bringing in new people with expectations and roles defined by the new leadership. This allows both parties to start from day-one on the same page. Either way it can be messy, but I can see how the latter process can help move the performance needle quicker. Third and possibly the most significant…There may be fewer decisions to make as you climb the ladder of responsibility, but the decisions can be anything but easy. The easy decisions are typically made by people who report to you. Now, decisions require more thought, the consequences are greater, and the answer will inevitably disappoint someone. I’m sure this advice has been shared by many intelligent people. Nevertheless, I’m not sure we are ever really prepared for this until we get into the situation. Recently I experienced the management of three decisions which fit this category – two of which deal with the significant rain we received in southeast Nebraska in the last 10 days. Crete, Nebraska – High school superintendent chooses to not cancel school when a number of schools in the area cancelled due to flooding. Crete schools did not have flooding. While this decision was accepted by most, there were some who were vocal about their displeasure with the decision and others that could not make it to school due to the weather. Had school been cancelled, you can bet just as many people would have been upset with having to find childcare. Depending on your individual circumstance, this decision may be acceptable or totally wrong! Crete, Nebraska – Doane College president chooses at last minute to move commencement services from the traditional outdoor service to an indoor service. Despite the fact that most Doane students look forward to an outdoor commencement, inevitably some of the spectators do not enjoy managing the weather as much. As an individual who helped directing parking that day in the rain, I can attest to a few disgruntled adults regarding the late decision – none of them, however, were graduates. Doane College faculty wrestle with decisions of an academic calendar which inevitably impacts different faculty, staff, and students different. I listened as they debated the issue and ultimately requested that more time be devoted to determining the best calendar solution. When this decision is made, it is likely that some faculty will not be satisfied. It’s easy to have an opinion on decisions that others have to make. It’s much more challenging to be in the position which makes the decision. To refer back to a prior blog post, there is no silver bullet to these decisions either. But, someone has to make them. So, my question to my friend…Do you want to be in the position to make these decisions? Who values the liberal arts? These questions are common of first-year college students, particularly those at a liberal arts school like Doane College, in Crete, Nebraska. And, to an extent, they are understandable. Today, possibly more than ever, I read blogs, articles, and comments challenging the value of a liberal arts degree. Enrollment managers and admissions professionals at liberal arts colleges around the nation, particularly those of us at colleges without national acclaim, address this question every day with prospective students. But, truth be told, all of higher education is being challenged today relative to the value it brings. I’ve read research that justifies the value of a liberal arts degree, but also the value of a college degree in general. And for every article I find, I anticipate reading an online rebuttal. We want black and white data which gives us an absolute guarantee in the value, nevermind the fact that every student is different and controls in large part their ability to be successful both during and after college. Moreover, how many students have completed an undergraduate degree at both a liberal arts college and a public university in order to give what may be the best opportunity to create a real comparison? So, instead of that elusive black and white apples to apples comparative data, liberal arts college admissions reps rely heavily on success stories, testimonials, quotes from HR managers who hire their graduates and CEO’s who believe in the liberal arts. This has an effect no doubt, and yet we all understand that the liberal arts college experience isn’t for everyone. And, for the moment, let’s keep the issue of cost out of this conversation because I think that muddies the water a bit and easily gets people wound up. Personally, I get a bit riled up when I read articles supporting liberal arts programs only to see crude, disparaging comments attacking those of us that believe in the value. Some will see value while others will not. I’m from the small town of Wahoo in rural Nebraska. My graduating class was less than 100 students. I was a good student who participated in a number of activities including choir, band, Fellowship of Christian Athletes, football, basketball, track, and baseball. I had a paper route and detassled corn in the summer for money. I took the ACT two times (only because my mom required me to do so hoping that I would get a higher score the second time and earn more scholarship money – nope!) and applied for colleges in the fall of my senior year. I applied to large schools and small schools alike to make sure I had “options”. Ultimately, I decided I wanted to continue to play basketball in college and quickly learned that not many NCAA Division I universities were calling me. But, that was okay because I was being drawn to these liberal arts colleges for some reason. The community feel and size quickly became appealing to me. I enjoyed a class project my high school senior year in English Composition which required students to research a potential career. For me it was desktop publishing. This was an evolving profession in the early 90’s, particularly as computers really gained capabilities. I was not an artist, but for some reason graphics were of great interest. Ultimately I chose Morningside College in Sioux City, Iowa, as my college because it afforded me both basketball and graphic design opportunities while also offering the comfortable environment for which I was looking. As a liberal arts college, Morningside required me to take a smorgasbord of courses that were not in my major; math, science, history, Spanish, and sociology to name a few. But, like most students I wondered why I needed those courses. After all, I was an art major. In addition, the college required me to participate in a speaker series which did not require homework but simply required me to show up and pay attention (the latter wasn’t always easy). And, my professors required me to participate in class. With only 20 students in my first-year English Comp class, the professor did not allow me to sit in the back of the class. He expected participation. Even more scary, upper division classes required collaborative work in teams. YUCK! Finally, I was required to participate in a first-semester class which focused on study habits, adapting to college, and other trivial, yet ultimately useful information. I was challenged every day and pushed outside my comfort zone while at the same time feeling supported by faculty and administration. The above experience is not for everyone. But it was for me. Although I enjoyed my major, it became clear to me during my senior year that I was simply not talented enough at graphic design. I did not have the confidence necessary for it to be my ultimate career path. Can you imagine that feeling during your senior year? Yes you can, because many of you had it! It was at that time that I leaned on everything else that I learned through my college experience that prepared me to go out and find the job that started my career. Coincidentally – and like many others that I know – I found my first job as a result of a recommendation by a mentor at the college. This administrator helped me make a professional connection which landed me my first job. This is very common at small, liberal arts colleges. Who you know does matter! I now work at Doane College, also a liberal arts college so yes, I “sell” this experience every day, but only because I believe in it as a result of what it did for me personally. I use math everyday, much more than I ever thought I would. I use graphic design much more than I thought I would, given my role as an administrator. I write more than I anticipated I ever would. I wish I would have taken more Spanish and enjoyed history class more than I did. I value the lessons learned in a safe environment in college related to collaborative and group work because the real world is a challenge requiring people to work together. To this day I could call up or email my former professors across many disciplines at the college and they would reply. Some receive my family’s annual holiday card. I’m glad I was forced to learn to study and use the library and research tools. Bottom line is that a liberal arts education has been around for a long time and while it has evolved to meet the needs of today’s students, the foundation is still very present. We educate people to be life-long learners and adapt to the careers of tomorrow. We require students to take coursework that they won’t completely appreciate until 5, 10 or maybe even 20 years down the road. A student with a 3.5 GPA in high school can likely be successful at both a large, public institution as well as a small liberal arts college. The true success is matching up the student with the type of college they want/need. So, the question is not whether liberal arts has a value, the more appropriate question is does liberal arts have a value to you? QUICK EDITORS NOTE: You may continue to choose to read this blog post or you may watch/listen to the post! Everyone likes getting mail during the holidays. I write my family’s annual holiday letter updating family and friends on what’s going on in the life of my wife, kids, and me. The result of this annual tradition – in addition to the increasing amount of online Christmas present purchases – is a crazy busy time of the year for the USPS as well as other delivery services. In fact, I learned while watching the TODAY SHOW that December 18th is anticipated to be the most significant mail date of the year! To be fair, I believe everyone likes to get mail, particularly personalized mail, regardless of the holidays. I still look forward to checking my mailbox every day when I get home from work – but, maybe I’m old fashion. I did turn 40 this year. There are fewer bills, statements and cards/letters in the mailbox compared to 10 years ago. Personally, I don’t get the hand-written card from my mom like I did in college. She emails or texts which I appreciate, but they still don’t have the same effect. Think about the last time you received something hand-written in the mail. Felt good, right? After checking with a colleague and Doane College alumnus at the United States Postal Service (USPS), I’m told that mail volumes have declined considerably over the last decade. First-class mail – i.e. bills, statements, letters and payments – has been significantly impacted by online options. As a result the USPS delivered 35% less First-Class Mail in 2013 than they did in 2004. While the rate of decline has slowed in the last two years (only a 5% and 4% drop in the last two years respectively) the first 2 quarters of 2014 shows that trend continuing. But, what about Standard A mail (aka Junk Mail)? Truth be told that Standard A mail has increased slightly in the last year and is down only marginally from where it was in 2004. Bottom line…less mail in the mailbox means what is in the box may very well get more attention by comparison to ten years ago. Two quick thoughts on this: First, with less mail, it’s understandable that businesses are working more strategically with Standard A mail to gain more presence in front of the consumer – to get noticed in the mailbox. Second, I believe the value of a personal note in the mailbox has more impact today than it did 15 years ago. I contend that the plight of first-class mail has actually made the mailbox more relevant today! In higher education enrollment management, communication with the prospective student is of paramount importance and ever more challenging to coordinate. For example, response rates to mail pieces are abysmal for the most part and the elimination of landlines makes it even more challenging to connect with a student via phone. Rather than wait for students to tell us they are interested, colleges use predictive models to determine who we need to target with our communication plans and ultimately we create communication flows that hit prospective student mailboxes on a regular basis even when a student hasn’t taken the specific step to tell us they are interested. We can’t afford to wait for the student to respond. Beyond general propaganda mail, however, I am also determined to create a mailbox presence for prospective students that connect to them personally. It’s true that printing companies can more easily print variable data on brochures and postcards to give the impression of personalization. While I think this works and has an effect, it still does not replace the value of the hand-written addressed envelope that contains something more personalized inside. Make no mistake, this isn’t easy to coordinate and takes time and energy. 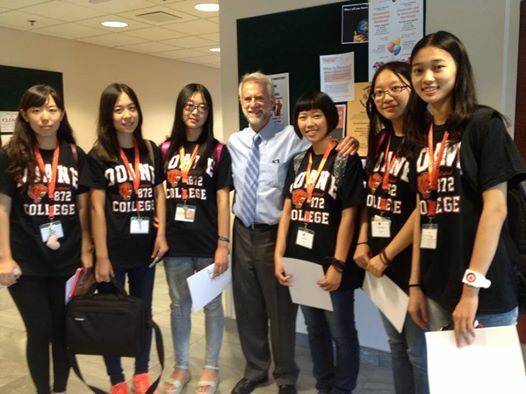 However, Admission Counselors at Doane College must make connections with prospective students that require them to think beyond the quick phone call or even the Facebook message or email. So, how about email? Studies have shown that prospective students prefer to receive college information via email. As a result, we push emails out to prospects regularly. So much so that people question if it’s too much. Do people really care that much about junk emails, so much that it frustrates them? Can you actually send too much email? Mass email can be easy and very inexpensive. Unfortunately, some enrollment professionals struggle to invest the time and energy to really think through an email campaign strategy. This is not an indictment on those individuals. It’s reality of our resources. I know we are guilty of that at times for sure. A discussion I hear in my office often is related to the volume of emails that we send to prospective students. I hear people contend, “We are turning them off with so many emails!” Really? A student is not considering Doane College because of how many emails we send? I think it’s an easy excuse for a person, but not the reason they are not coming to Doane College. I simply think it’s unfortunate for a college or business to fear sending too many emails. That said, it is important to have a balance – purpose and volume. People can easily opt-out of email campaigns or they can simply ignore them. I get an email a day from Kohls – maybe even two or three this time of year – and it doesn’t bother me because I know it’s there if I’m interested. It takes more energy for me to opt-out or send a nasty-gram for them to stop sending me emails. Lets be clear, however. Quantity and quality are two different issues. I’m in favor of significant volume of emails, but there has to be a strategy and a vetted message to these emails. They do represent your brand. College enrollment professionals lament over different strategies to engage with high school students during the college search process. We utilize all modes of communication in what sometimes seems like a lost cause. Does our mail get opened? How do we know if they don’t respond to the tear-off card or go online with the customized URL. Do they even receive our email campaigns? We create landing pages, review open-rates and click-through stats in hopes of validating our efforts. We look at Google reports to see the pages visitors land on. Today, we can’t obtain as many valid phone numbers because there is no landline! We pay exceptional amounts of money to firms to help us manage the communication flow to prospective students, which includes a select number of mail pieces, email campaigns, and phone calls. We consider the message, the look, the timing, and the volume of touches all in hopes that the student engages. There is no silver bullet. But, moving all online and eliminating a mailbox strategy is a sure death in my opinion. Take advantage of the mailbox today. It’s not nearly as cramped as it once was. Get your college into the conversation by making sure your brand lands on the dining room table or counter at the end of the day, preferably at the top of the pile. The mailbox still matters. Use it strategically. Hand-written addressed envelopes are effective. Be aggressive with emails, but give thought to your message and subject lines for best response rates. Top of the mind awareness is the name of the game. Be there when they are ready for you. Can you dedicate a person to manage this activity and report on successes and failures? QUICK EDITORS NOTE: You may continue to choose to read this blog post or you may watch/listen to the post as a vLOG or Video Blog – 7 minute video. Athletics is such a significant part of the lifestyle and culture of so many young men and women today, particularly in smaller rural communities. It’s a component of their social life. It should be of no surprise that many student-athletes in high school consider continuing their athletic experience into college, at least early in exploring college options. It may very well be a comfort thing. It’s what they know. And, depending on the school – and obviously the individual – the athletic accomplishments may suggest that college athletics is a real possibility for young Johnny. Many colleges and universities have taken advantage of this culture over the last 15-20 years increasing the number of athletic programs on college campuses and offering junior varsity and even freshman programs. While larger universities have traditionally offered intramurals, smaller colleges may simply not have the population to manage that on their own campus, but they could increase opportunities and competition with other colleges. More importantly for many colleges, the increase in athletic programs is a way to increase enrollment, something desperately needed by many colleges both then and now. It makes sense financially for many and has proven to be quite successful. So, how has this impacted the way admission offices recruit and interact with prospective students? First, let me take you back about 20 years to my experience being recruited as a student-athlete. Of course, we have to take into consideration that the internet was only known to Al Gore (that’s a joke folks), email wasn’t available, cell phones didn’t exist in mainstream population, and it was much more difficult to share video. But, the Pony Express still delivered out of Wahoo, Nebraska at that time delivering VHS tapes to my potential college suitors. Ah, the glory days of yesteryear. But I digress. Connecting with high school student-athletes is different. I stop short of saying it is any easier today just because we have the technology of cell phones, email, social media, and more. But with all that said, I reflect on my experience and share some observations. More young men and women today believe they can play college ball. Maybe this this is a simple result of colleges providing more opportunities. But, I also believe that the effort to use sports as enrollment has sent the message to many that they can play college ball even when many of them will never see a minute of varsity time. Personal and sustained contacts through the recruiting process still matter. In fact, I still contend that snail mail has grown in impact since email and social media took over. My senior year I received a personal note of some kind from my college of choice almost every other week. Students still like the personal connection, particularly with schools and coaches they like. Athletic scholarships are readily available! I tell many high school athletes, if you want to play, it’s likely that someone will give you a scholarship. The amount of that scholarship, however, can vary greatly. Entitlement vs. Opportunity. I say this with some trepidation. But, my experiences have increasingly witnessed parents negotiating – serving as an agent – with colleges rather than being thankful for the opportunity. Evaluating real talent is easier. Technology has had a tremendous impact. HUDL for example has put my freshman son’s highlights in the hands of family, friends, and ultimately college coaches. But also, the increased opportunities at colleges, suggest to student-athletes that they can and should dream bigger rather than limiting their opportunities to only what they know geographically due to what they get in the mail or see on tv. Smaller colleges and universities have a value proposition they may not have had previously. Due to increased opportunities, many young men and women see the significant value in the smaller college as a place to continue playing something they love. Consider the addition of men’s volleyball and women’s wrestling at schools in the Midwest. Would a student have considered such schools if not for athletics? For some, it comes down to the decision of playing. I’ll go to XYZ College if I want to keep playing and I’ll go to ABC University if I choose to give it up. Personally, I don’t think it should be this way but I understand the mindset. Admissions offices are greater extensions of athletic recruiting. It’s more of a partnership today to meet common goals. I remember when coaches would forbid admission offices from contacting certain recruits. Today, coaches seek and often need the support of admissions to maintain the connection with a larger number of potential recruits. I’m sure this isn’t always the case, but I’ve seen it evolve at my institutions. Bottom line is that things have changed. I’d argue it’s a buyers market for student-athletes right now at smaller NAIA and DIII colleges and universities. That being said, we all know that not everyone can play in college. College athletics is just like high school in that winning is the objective and players who contribute best to the team and winning will be on the floor, field, or competition space. Fortunately, students get to choose how important the opportunity to continue is to them. But, they also need to be prepared for when their number doesn’t get called. Fit is important! Hopefully, they’ve picked the college in which they can transition smoothly to experiences that will translate into a great career outside of athletics. So, for my shameless plug….I believe we do this very well at Doane College. We have many fine students who thought they would play college sports only to find that life after organized sports can be just as rewarding as the experiences on the court. But, like most college athletic programs, we also anxiously await all football players with a 4.2 40 speed and a 42 inch vertical leap….who meet our admittance requirements of course.